What violation will increase time on SR-22 requirement? What violation will increase time on SR-22 requirement? If you already have a SR-22 requirement, the best thing you can do is simply try hard not to break more traffic laws. The violations that got you the SR-22 in the first place, if broken will cause you to get more time with your SR-22 if they are repeated. This article therefore is more of a reminder of the things that get you a SR-22 requirement in the first place. Let us then delve into the issue at hand. 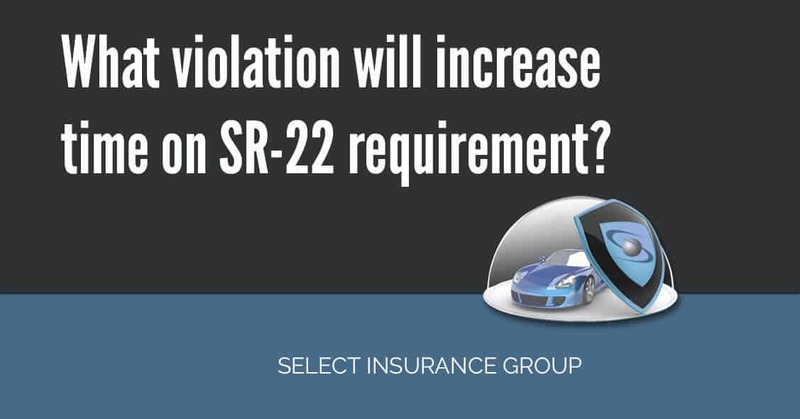 What will cause more time on your SR-22. If you are driving around and your auto insurance has expired, be warned that if your insurance company has not already notified the DMV, then it is just a matter of time. Actually it happens as soon as your cover expires. Do not be fooled into thinking because your insurer has known you a long time they will hesitate to inform the DMV about this matter. It is a provision of the law that they must report this matter as soon as it happens. Do not be callous enough to make the choice to drive around without a valid insurance cover. It’s a matter of time before you are arraigned in court and once again you are issued an order to get a SR-22. Drunk driving or intoxicated will put you back in the very place you were in the first place. Because of your repeated violation of this law, your license will be suspended once again and you will need a new SR-22. Do not get cocky though; this violation may see you sobering up behind bars if it is the third time caught violating. Depending on the state you are in sentence may vary. Second time offenders may get away with it, but again your license will be suspended and you will start all over again. As stated, do not get yourself to a third time driving intoxicated. Because, that is a definite jail sentence awaiting you. Getting involved in an accident and choosing to flee the scene is not a wise choice. Of course, if by some miracle you get out of jail in the minimum time, you will definitely require another SR-22. Your chances of getting away with jail time are very low though. Well, like it has been mentioned, you will find yourself in a very awkward position explaining how you may have caused death despite a SR-22. We are not insinuating that an accident cannot happen when you have a SR-22. In-fact that is the reason why you need it. However finding yourself in a vehicular manslaughter is not favourable for you. You may be jailed. But even if for some reason you are not jailed, your license will definitely be suspended and you may require a SR-22 once more. If you are caught without a license or without a valid one you will require another SR-22. That is if you can avoid getting your driving privileges permanently revoked. Yes you may have got away the first. But still you insist on collecting tickets all over that amounts to arrogance. And for your attitude you will have to get another SR-22 requirement. As a matter of fact, you need to be very watchful cos it may end up with you losing your driving license permanently at some point. Street racers have the tendency to pose risk. And if you have been convicted of this illegal activity, you probably have a SR-22 with you. If you are found doing it again the penalties become steeper and your SR-22 requirement is renewed all over again. The law surrounding SR-22 is very complicated for most people. Some lawyers included. If you have an SR-22 and face yourself with a fresh requirement, you need to contact us so we can help you figure it all out. We specialize in high risk insurance and we will give you the very best services. We are qualified and experienced to deal with your situation. Older What is required to have SR22 ?